The Nash brings new life (and wood-fired rotisserie meats) to the historic National Hotel building in Inglewood. The Nash anchors the restored National Hotel building in Inglewood. Photograph by Jared Sych. FOOD | Wood-fired rotisserie meats and gourmet comfort foods. VIBE | Upscale urban charm. DECOR | A bright and modern space that nods to the building’s history. DISH | You have to try the Happy Chicken (here or to go) but it would be a shame to miss the carrot tartare. TIP | On a cool day, sit near the fire (just be prepared to smell a bit like smoke afterward). These days, the city has plenty of historic buildings experiencing new lives as restaurants – and many of them are celebrated in this issue. There are also plenty of restaurants and chefs who get involved in community work. But there are few doing as much, as consistently in every facet of their work, to not only serve their patrons but to build their community as The Nash and more specifically chef-owner Michael Noble. First, Noble worked with the building owners to restore the historic National Hotel, which sat vacant for many years before he took over most of the main floor space to become the Nash and Off Cut Bar. Then he established The Nash as a strong supporter of local businesses and charities through projects such as the Cheers to Inglewood cocktail collaboration (where The Nash worked with neighbourhood businesses to create cocktails that raised money for the Alex Youth Health Centre) and the Off Cut Culture Club (which gave a different local artisan or designer a pop-up sales space on Saturdays through the fall). 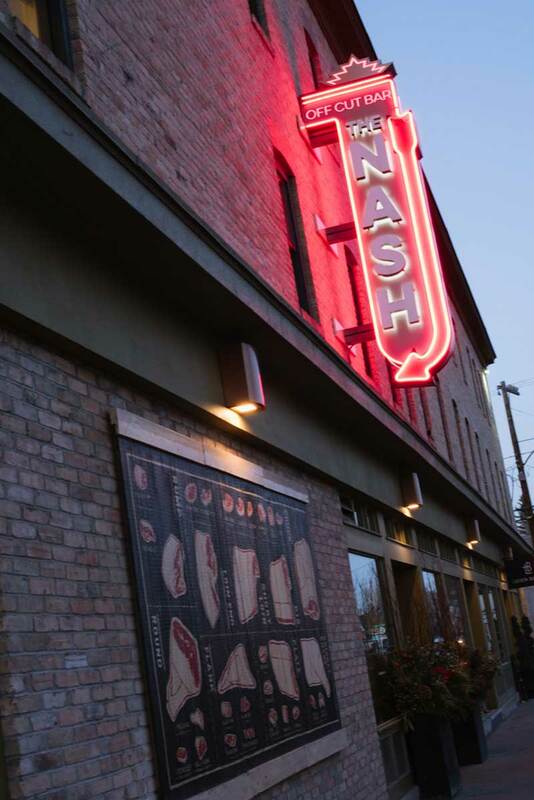 But while laudible, what gets The Nash recognized here is the gourmet comfort food, the juicy rotisserie meats, the can’t-put-it-down hamburger, the inventive desserts and the quick and thoughtful service. The Nash, and its lounge The Off Cut Bar, is a spot where you could easily linger all day and well into the evening, watching the who’s who come and go, enjoying yet another round of cocktails, perhaps some more of those Josper roasted prawns, until the live music dies down and they politely ask you to leave.